(CHRIS) After the usual breakfast of Europe (bread with toppings), we sprang bouncy and light to the beloved Renault 19. Why were we so joyous? It was windmill day in Holland. We all danced and sang in joy, "We're going to see the windmills; the windmills we will see." Holland, you see, is the most influential part of the Netherlands and it is thus that the country as a whole is often called Holland. 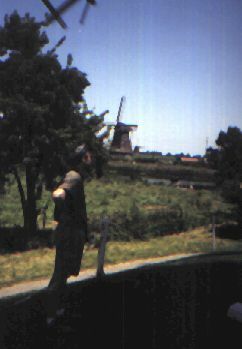 And what made Holland so powerfully YES--wooden shoes and windmills We had to experience both of these things, so after trying on some windmills, we climbed a wooden shoe. Strike that--reverse it. 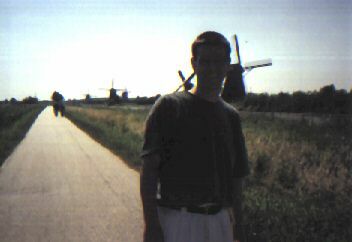 Yes, we visited the most dense population of windmills, used here to channel water up hill in a canal. The mills can also be used to churn grains. (We were in the town of Kinderdyke.) We were able to meet one of these towers of power up close and personal. There was a good breeze a-blowin' and the mighty arms spun like a ninja's throwing star (only 1000 times the size,) daring anyone to walk into the luscious grass at which it grasped, missing each time by only a foot. Only a week chain told us the boundaries of the mill's wrath. "None shall pass," it seemed to say and we dared not challenge the mighty four armed goliath as Don Quixote had done. However, for a small fee, (covered by Andrew "Quick-draw wallet,") we went within the structure. (SAM) In the first floor of the windmill, we saw a little kitchen. On the second floor we saw little box beds. On the third, fourth, and fifth floors, we saw the huge wooded cranks and crank shaft that ran down the length of the windmill. There was a great breeze blowing through the open windows. It was all very cool and fun and Andrew filmed with the camera. Windmills make us hungry, in fact everything makes us hungry, so Andrew took us to a PANCAKE HOUSE. Chris and I were so happy, we raced there. But, oh no, this was not an ordinary American pancake house. This oasis in the midst of windmills was PANNEKOKE. It was very pretty, little flowers, cute little tables and chairs, and little pink napkins. I personally like hunter green napkins shaped like a bird at my place. One could order absolutely any kind of pancake. We partook of banana, ham, mushroom, and cheese, strawberry, and even rum pancakes. (Historical note--a small plastic bag, at least that is what I think it was, just flew in the open window, past my face, and into the back window. Before any of us could react, it flapped back to the front, paused, and then zipped back out the front right window from wence it came. I will let the reader interpret this strange and disturbing omen.) After out authentic Dutch feast, we experienced relief in an authentic Dutch restroom. Then we jumped into the blazing saddles and made our way back to Rolduc. At the home base, we chilled for twenty minutes before vespers. The singing, again, was very uplifting. Then we went to supper. The rector announced that there would be football that evening in the very nice field located behind the buildings. (MATT) We split up with the Dutch locals, and had a great game of five on five. It was alot of fun. Jon proved to the little Dutch boys (seminarians) that some Americans really can play football their way. He also proved that he really never does get tired. We all held our own on their turf in their game. Jon and I had one assist and two goals each (Jon might have had three goals even.) Sam showed his stuff with a couple of assists and his usual blinding speed. Franz--Joseph yelled to Sam after one of his amazing bursts of speed, "Hey, Sam, how fast can you do the 100 meter?" Sam in his usual candor smiled and continued the race to replace all the oxygen that had completely left his body. It was fun for all except maybe Chris. He had to be at least a little frustrated, life-long soccer player that he is, being forced to watch because of that old college soccer injury. Well, we should keep this a secret, everybody, so don't tell, OK? Chris did get a few minutes to kick the old ball around for a few minutes just to see if he had the moves. I think they were a little out of shape because one of them turned to me, who am in distinctly worse shape than the machine Jon and the monster Sam, and said, "You're in really good condition." It must have been all that hiking in Switzerland that did it. I just laughed and pointed at Jon and said he's in shape. We all had a really good time. After soccer, we all showered and rendezvoused in Andrew's room for some Fanta and deep fried mashed potatoes. (Don't look at me like that, it wasn't that bad) which we dipped in mayo. (Note: that did make Sam sick the next day but the rest of us rather enjoyed it--so there.) We had a nice evening with our old friend, talking about old things, new things, borrowed things, and no, no, no, wait a minute, that's what Jon was thinking about while we were talking of old friends, good times, and good biers., Actually, we did tell him about our favorite biers in Prague and Bavaria. Andrew was also a news source from the home front--thanks to Mary Lou. He told us of Fr. McLucas and Peter Lemmon leaving Christendom and John Echaniz and Damian Fedoryka joining the ranks. Wow--we Have been gone a long time. We all slept that night... as usual.